The query use’s a ‘cost’ column – which could be anything thing you like – to calculate the shortest cost from one node to another. In this example I decided to use travel time (rather than distance). First, I changed the distance of each vertex (the way table) from km to miles, and then calculated the time it would take to traverse each vertex whether walking, cycling or driving. To make this more accurate, I updated the max speed (forward and backward) along each vertex dependent on its class (as listed in the class table). Now we can run the following query to find the shortest distance between 2 nodes. This produces a list of vertices, with the cost as ‘len miles’ for each, which tracks a route from node 1924 to 72515. 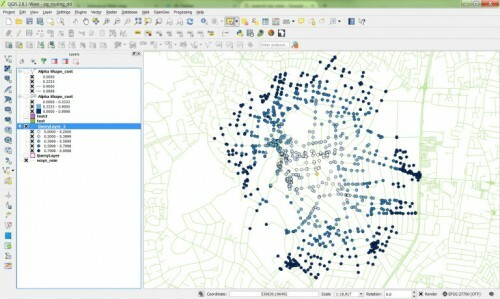 To put this into qgis we need to join this to the ways table which contains the geom for each vertex. These can then be placed in the Djkstra query!